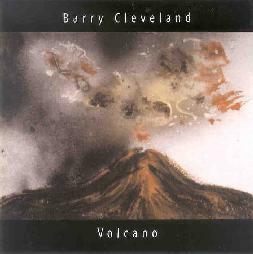 Barry Cleveland - "Volcano" / "Memory & Imagination" / Cloud Chamber - "Dark Matter"
Guitarist and music journalist Barry Cleveland has been recording steadily, both solo and participating in other musicians' projects, since his debut album was released on Larry Fast's Audion Recording Company label in 1986. Barry's intention with his latest release, Volcano, is to explore music based on African-Haitian rhythms, fused with stylistic influences that include progressive rock, jazz, ambient and myriad "world music" (quoting from the promo sheet). Reading that the instrumentation throughout the album is primarily made up of electric guitar, bass, flute/sax/winds and percussion, I was surprised at the range of sounds and effects the musicians create. The mindbending thrum of Michael Manring's bass is a key ingredient, while Barry's guitar produces a range of tonal delights, the result being a space-jazz-progressive-psychedelic stew that at times occupies realms similar to ethno and ambient jazz artists like Steve Tibbetts and Steve Lawson, and at others bears similarities to British festie psych bands like Ozric Tentacles and Krom Lek. Though mostly instrumental, Lygia Ferra's beautiful chanting vocals add to the cosmic factor on "Secret Prescriptions Of The Bedroom", a song that straddles the line between ethnic flavored jazz and Eastern influenced psychedelia. I also dig the male/female vocal combination of Ferra and Max Taylor on the aptly titled "Dervish Circles". Congas galore propel the rhythmic pulse of "Black Diamond Express", with it's Shadowfax-like dreamy and uplifting world music feel and Fripp styled guitar patterns. I love both the hypnotic wailing and dreamy singing guitar sounds on "Ophidian Waves", played against a throbbing rhythmic pulse. "Obsidian Night" goes deep into space with even more killer guitar. Both these tracks are highlights of the set. Overall there's LOTS happening here and Volcano will easily appeal to a varied crowd, including prog rock fans, world music lovers who want adventure, and certainly space rock and psychedelic fans who have a taste for jazz and ambient music. The music is intricate... seductive... trance inducing... and your body will want to MOVE. 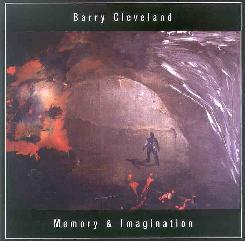 2003 was a busy year for Barry Cleveland, having also released the 2-CD set, Memory & Imagination. Disc 1 includes what he considers to be the best of his first two albums, Mythos (1986) and Voluntary Dreaming (1990). Disc 2 includes recently remixed pieces created circa 1993 that were produced using only guitar and percussion, along with a solo guitar piece performed live on the Echoes radio program in 1993 (quoted from the promo sheet). With Volcano being my introduction to Barry's music it was nice hearing the earlier tracks from his first albums. I was immediately struck by the prominence of percussion and world music influences on several of the tracks, elements that have apparently informed his work through the years. Several of the musicians that participated in Volcano are present on these early albums, though the tracks are mostly solo and duo performances, and Barry plays synths in addition to guitar. The effects and sound processing that made Volcano such an interesting and beautiful experience are present, though the earlier music is characterized by more mellow, floating journeys, with a powerful ambient soundscape element. But even when the percussion is up-front, it is busy and varied... and yet so steady and smooth. I love the pedal-steel on "Ritual Sticks". We're even treated to heavenly symphonic space on solo tracks like "The Inward Spiral" and "Cleopatra's Needle". "Hawk Dreaming" is an intense piece that has some of the most cosmic winding guitar on the album. "Abrasax" is a standout track that combines Frippoid guitar patterns with bass throbbing drones, spacey symphonics and beautiful wailing guitar lines. But the highlight of disc 1 is the 19 minute "Mythos", a gorgeous blend of meditative drones, symphonics, psychedelia and a hint of the avant-garde. The music builds slowly throughout, intensity levels rising but never peaking. The journey is the focus... too much focus on destination would only be a distraction. I was particularly eager to dive into disc 2 when I saw Carl Weingarten's name appearing on three tracks. I loved the playful slide and dobro melody he contributes on "Still Smiling", played against a steady tribal rhythmic pattern. "Snakey Jake" is a very cool bit of psychedelia given an extra kick of cosmic Blues from the dobro. The third track Weingarten plays on is the nearly 25 minute epic "Memory & Imagination", a deeeeeeep in space voyage with a banquet of brain candy sounds from the guitars and dobro, and a continual wave of varied soundscape textures and drones. Imagine Ash Ra Tempel meets Frippertronics. I got completely lost in this track and would have been perfectly happy if it had gone on for an hour. Absolutely beautiful. We've got several solo tracks from Barry too. I really liked the varied guitar sounds on "Signless". A nice blend of spaciness, rock and tribal rhythms. "Bottoms Up" has a dancey cosmic groove that I enjoyed. I love the trippy Eastern vibe on "Lucid Mirrors Of Eroticism". I've mentioned Fripp a few times in this review, and the excellent "Echoes On Echoes" has the most overt Fripp influence of any of these tracks. "Stones Of Precious Water" is highly meditative but also a tad on the avant-garde side. Another varied combination of guitar sounds and effects. And "Indigo Blues" ends the set on a floating Tangerine Dreamy note. 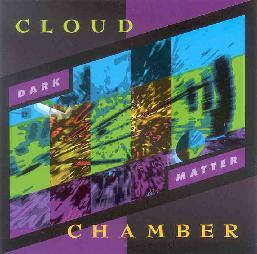 Cloud Chamber is an all improvisational band project that includes Barry Cleveland, and though the Dark Matter CD was released in 1998 it hasn't been heavily promoted until now. In addition to Barry on guitar the lineup includes Michael Manring on bass, Michael Masley on bowhammer, cymbalim/dulcimer, kalimba, gobeon, gobek and panpipes, Dan Reiter on cello and Joe Venegoni on percussion. The music is in many ways very different from Volcano and Memory & Imagination, including avant-garde free-improv and orchestral elements. Tracks like "Blue Mass" and "Radiant Curves" have a strong chamber music influence, with passionate cello melodies, a spacey vibe, and much more. "Full Of Stars" is one of my favorites. It begins with a spaced out alien glom of avant-garde free-improv, but after a few minutes a rhythmic bass pattern sets things on a more determined path. The music is dark and intense and has a soundtrack quality, though it's nothing you'll hear in any Hollywood production to be sure. It also rocks out in its own off-beat way, though orchestral based free-improv is the main focus. Lots happening here and is definitely a track that reveals new treasures with repeated listens. "Solar Nexus" gets into more jazz oriented territory, though the chamber influences are present as well as the ever present spacey feel that characterizes much of the album. The last minute of the track is the best... a nice little freakout bit. "Ursa Minor" is another track with a soundtrack feel, this one being more purely orchestral and with a strong Indian influence, though we also travel through jazz, psychedelic and symphonic realms. "The Call" features more jazz and Indian stylings. And at 13 minutes "Dithryamb" is the lengthiest track, though not the most cohesive. The first several minutes consist of jazz with a head bopping groove. But around the 6 minute mark the band do a 360 and take off into dreamland, with eerie wailing strings and ambient backdrops. Equal parts haunting, spacey and darkly intense. But the rhythmic patterns soon kick in again and the band simply explores throughout the remainder of the track. A nice atmospheric groove tune. Lots of good music on this album but newcomers should most definitely start with Volcano or Memory & Imagination, the albums which really grabbed me by the throat. I'll definitely be keeping track of Barry's activities. For more information you can visit the Barry Cleveland web site at: http://www.barrycleveland.com. Contact via snail mail c/o Barry Cleveland; 334 King Street, Redwood City, CA 94062.